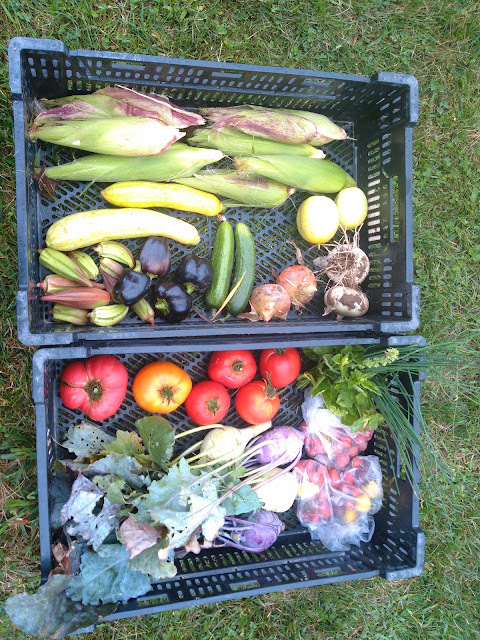 The weather has cooled off this week, we've received lots of rain and 3 days of temperatures at a breezy 65 F. New this week are summer favorites: sweet corn and okra! 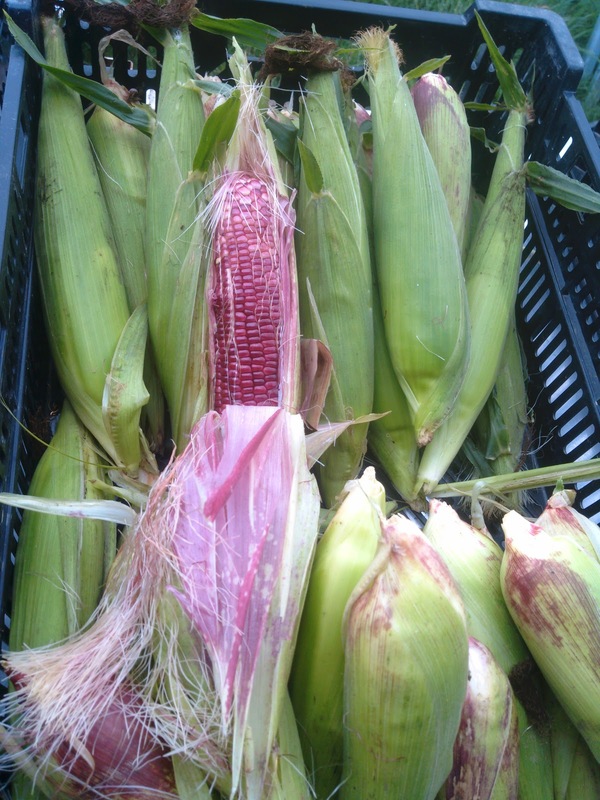 This week's corn is mostly a favorite variety of ours called Ruby Queen corn, next week we will have a white corn. 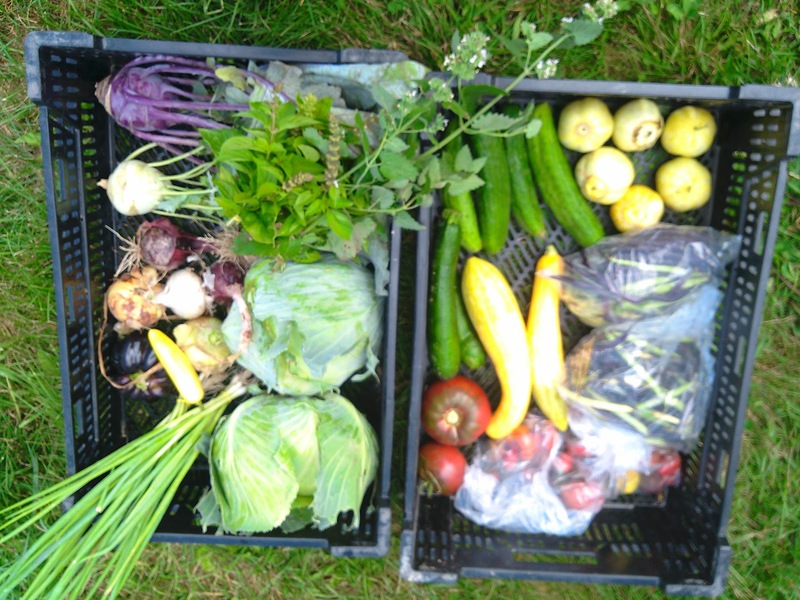 We are just reaching the zenith of the summer harvest, when we get to savor vegetables and fruits and herbs all at once from the farm. The garden still has lots more to go, we'll be seeing ground cherries again and melons and watermelons soon, after that the final flourish with winter squash, fall apples for pie, root crops, and celery and brussel sprouts and hopefully a return of our spring favorites like salad greens and green onions and spinach. The season is far from over! New this week is an heirloom variety of Okra called Hill Country Red from Seed Saver's Exchange. Try them fried, baked, in soup, we always like to make cornbread with them. The products of the plant are mucilaginous, resulting in the characteristic "goo" or slime when the seed pods are cooked; the mucilage contains soluble fiber. Some people prefer to minimize the sliminess; keeping the pods intact, and brief cooking, for example stir-frying, help to achieve this. Cooking with acidic ingredients such as a few drops of lemon juice, tomatoes, or vinegar may also help. Alternatively, the pods can be sliced thinly and cooked for a long time so the mucilage dissolves, as in gumbo. The immature pods may be pickled. New this week is the first sweet corn of the year! Small shares get 4 ears, Large shares get 8. We should have more for next week too. This week is mostly a Burpee variety called Ruby Queen, and it's delicious! Sweet corn quickly looses its sugars the longer it is stored, so eat these up quick and enjoy them while they are at their best flavor. We have some huge slicers this week for everyone, our heirloom varieties Brandywine Suddhith's Strain and Kellogg's Breakfast are starting to come in, and these are whoppers! Have a fantastic BLT, or adult grilled cheese, or make some bruschetta or salsa. We also have a roma and bag of snacking tomatoes with more for sale. This week we have a purple bell pepper for everyone. Everyone gets a two onions, white or sweet, this week. Cucumbers have been doing well in the the greenhouse, though those out in the field have now officially lost the battle to cucumber beetles and downy mildew. We like to eat the lemon cucumbers raw, like an apple, but they can be pickled or used in salad or cucumber salad just like any regular cucumber. More summer squash this week, Try these sautéed or steamed or grilled, but they also make a great addition to a quiche or frittata. Sadly the squash beetles have been holding back our zucchini, so we haven't been able to get any good size zucchini for zucchini bread. This week for herbs we have more Italian basil and onion chives. We had a sick pig this week on the farm. We noticed one of our pigs, Anya, laying down more often, taking much longer to get up, and eating less than the other pigs, the next day she had developed a limp and a red diamond mark on her shoulder. It was our old nemesis, eryseplyas! One of our pigs, Daenerys, got very sick with this bacterial disease 2 years ago, and it can quickly lead to the pig's death. So we went and got some penicillin, and gave Anya a dose, and another the next day. She has improved remarkably, and is in the clear. 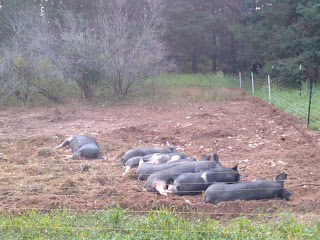 But we are keeping a close eye on the other pigs to detect any signs of infection. We do not like the overuse and abuse of antibiotics in conventional factory farms, where are used profilactically to keep the animals alive in unhealthy conditions rather than promoting healthy conditions. Rather, the way we currently use antibiotics on factory farms is encouraging antibiotic resistance in animals and humans. Antibiotics should be conserved as an important piece of scientific heritage, one saves lives, and we could very well lose if we abuse its use. Besides the one sick pig, the pigs have been enjoying cool wallows and shade, and a new trick we picked up from Temple Grandin's Animals Make Us Human. In it, Grandin recommends giving pigs flakes of straw or telephone books to pigs to play with and tear apart, as they love using their noses to root and poke about. So if any of our local readers has any old telephone books they'd like to clear out of their house, send them our way! New this week is the first ground cherries of the year, which make a fun desert as pie or ice cream topping for a summer treat! 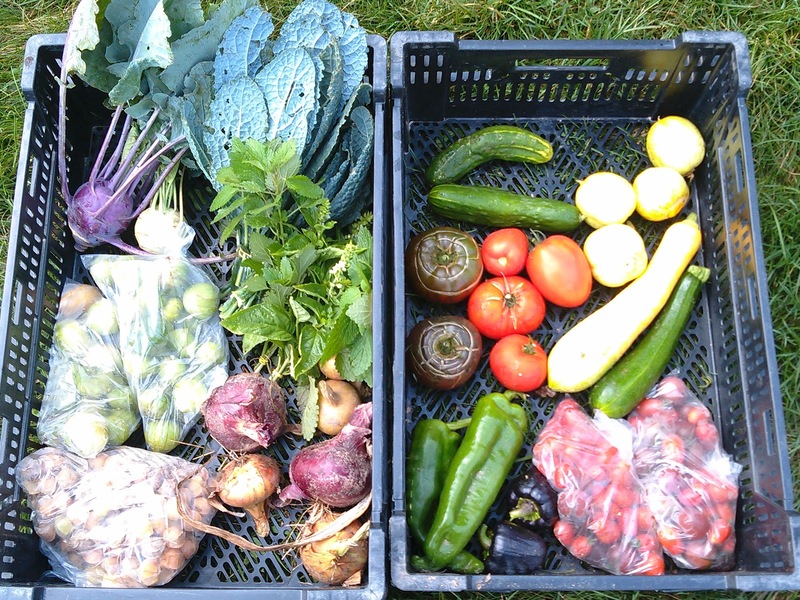 Large Share Pictured: 2 Kohlrabi, 2 herb bunches, 2 bunches kale,2 lbs tomatillos, 6 onions, 1 lb ground cherries, 2 cucumbers, 4 lemon cucumbers, 2 slicing tomatoes, 2 roma tomatoes, 2 lbs snacking tomatoes, 2 summer squash, 2 anaheim peppers, 2 bell peppers. This strange golden berry is related to the tomato plant, and is indigenous to the new world. It has a similar texture to the tomato, but in flavor is more like strawberry or pineapple. The fruit are rich in cryptoxanthin, and contain pectin and can be used in pie filling. They can be eaten raw and used in salads, you can add them to dessert, use as flavoring, made into fruit preserves, or dried and used like raisins. 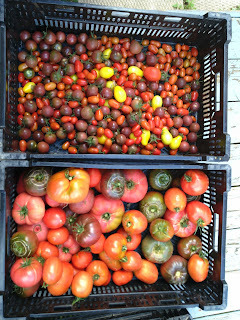 Lots of tomatoes for this week! Everyone gets to try the slicers, the roma, and the snacking tomatoes. We've still been seeing lots of the tomato horn worms out in the field and in the greenhouse, a few that are just hatched and young and a few big buggers that escaped us before. 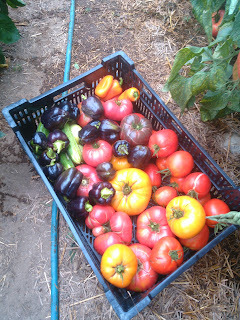 This week everyone gets extra tomatoes, so try making some salsa or bruschetta or the full Chille Rellenos recipe! This week we have a bell pepper and an Anaheim pepper for everyone. More tomatillos this week. We enjoy making a salsa verde out of these or for enchilada sauce with chicken or pork. They also go well in a pot of chili or soup! These are easy to preserve for another day, just take out of the paper-lantern like husk, wash and then freeze whole for later. Everyone gets a three onions again this week. Cucumbers have been doing well in the the greenhouse, though those out in the field are losing the battle to cucumber beetles and downy mildew. We like to just eat the lemon cucumbers raw, like an apple, but they can be pickled or used in salad or cucumber salad just like any regular cucumber. Kale is back again this week, it's nice to have some greens again! Try these sauteed, or add them to a soup. Or try making Kale chips with them! This week for herbs we have Italian Basil and citrus mint. Try steeping a few mint leaves in a cool glass of water for a refreshing drink on a hot day! The garden is in full swing, though it's also getting a bit buggy--with tomato hornworms, squash bugs, cabbageworms, and cucumber beetles. The cucumber beetles have infected all of the cucumbers outside in the field with downy mildew. Luckily the greenhouse cucumbers are still going strong! Tomatoes are coming in well, we're only seeing a little damage from the tomato hornworm, we've been keeping up the watch for them, and we've only see a little bit of calcium deficiency, which causes blossom end rot. We decided it would be a good week as well for fried green tomatoes, pulling off a few green ones this early helps the other fruit to ripen faster. We'll have plenty of extra green tomatoes, heirloom slicers, snacking tomatoes, and some roma available at pickup and market, so enjoy a fantastic BLT or some bruschetta this week! If anyone is interested in helping out at the garden, getting some sun and some exercise, just let us know, the garden could use a good weeding and we always appreciate the help! Available at Ionia Pickup 6-6:30 at the Farmers Market Pavillion, Friday at the Harvey's Farmers Market 1-5 pm, and at our farm stand. 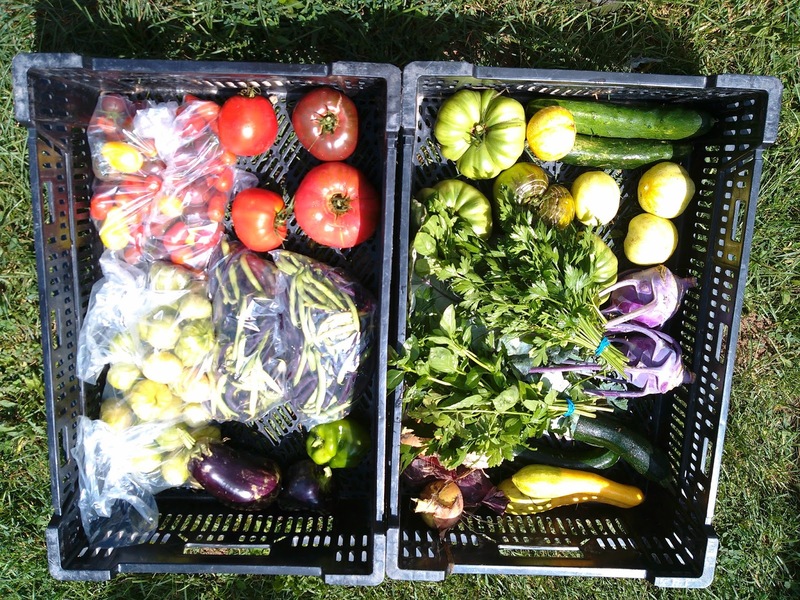 Large Share Pictured: 2 Slicer tomatoes, 2 Roma, 2 bags of snacking tomatoes, 2 lbs tomatillos, 2 lbs green beans, 1 eggplant, 2 bell peppers, 4 green tomatoes, 2 slicing cucumbers, 4 lemon cucumbers, 2 bunches herbs, 2 kohlrabi, 4 summer squash, 6 onions. New this week we have green tomatoes! We know we enjoy making fried green tomatoes every year, and we didn't want you guys to miss out! New this week for only our Full Shares are the first Eggplant of the season! Lots of tomatoes for this week! Everyone gets to try the slicers, the roma, and the snacking tomatoes. We've been seeing lots of the tomato horn worms out in the field and in the greenhouse, probably found and killed over 20 today! This week we have a bell pepper for everyone. More tomatillos this week. We enjoy making a salsa verde out of these or for enchilada sauce with chicken or pork. They also go well in a pot of chili or soup! These are easy to preserve for a later day, just take out of the paper-lantern like husk, wash and then freeze for another day. Our green bean mix includes purple, yellow and green beans, which will all turn green, except strangely the yellow variety, when cooked. More Summer squash this week, 2 for small shares and 4 for large shares. Try these sautéed or steamed or grilled. Sadly the squash beetles have been holding back our zucchini, so we haven't been able to get any good size zucchini for zucchini bread. This week for herbs we have Italian Basil and parsley.